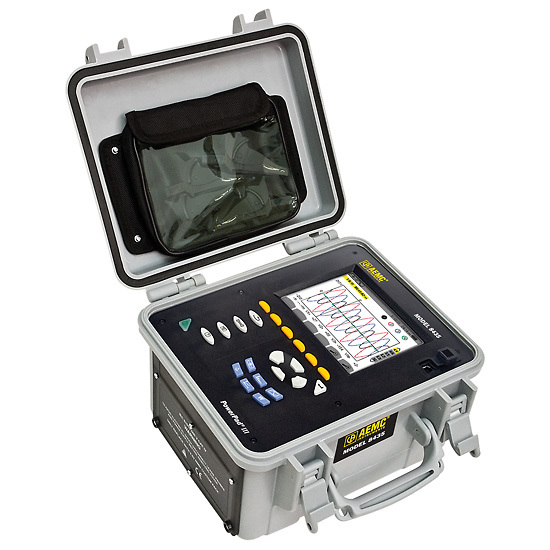 The 8435 PowerPad III is a high quality three phase power quality analyzer and logger. Some of the main features of the 8435 are listed below, for a more complete list please see the datasheet or contact us. Measurements TRMS Voltage up to 1000V rms AC/DC for 2 to 5 wire systems. Direct measurement of neutral current & voltage. Frequency measurement (40 to 69Hz systems). Record and display trend data as fast as once per second for one month for up to 25 variables. Transient detection on all V and I inputs (up to 210). Select-able PT and CT ratios. Calculation of Crest Factors for V and A. Calculation of short-term flicker and three-phase voltage unbalance. Measures harmonics (referenced to the fundamental or RMS value) for voltage, current or power, up to 50th harmonic. Displays of harmonic sequencing and direction and calculation of overall harmonics. Real-time display of Phasor diagrams including values and phase angles. Measurement of active, reactive and apparent power per phase and their respective sum total. Calculation of power factor, displacement power factor and tangent factor. Recording, time stamping and characterization of disturbance (swells, sags and interruptions, exceedence of power and harmonic thresholds). 2GB internal Trend Recording memory; Alarm, Snapshot and Transient/Inrush memories are separate. The Max and Min RMS measurements are calculated every half-period.